The mojito is a refreshing rum cocktail that is said to have originated in Havana, Cuba. The cuban rum drink is commonly created with five ingredients, including white rum, sugar, lime, carbonated water, and mint. The mojito combines citrus, mint, and sweetness to cover the taste of white rum. This unique mixture has made the highball cocktail a refreshing summer drink. 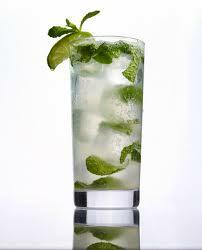 It has been said that the mojito’s name originates from mojo sauce, a Cuban lime seasoning used to flavor various foods. Potentially the name made reference to the lime ingredient and the drink became known as the cocktail with “a little mojo” in Spanish, or the “mojito”. The popularity of the mojito has increased over the past decade. Once native to Cuba, Key West, and Miami the Cuban cocktail has spread into many trendy bars and restaurants across many cities.